Laurel hedge plants are one of our best selling groups of evergreen hedging, they are easy to grow, give great privacy, look good all year round and come in a huge range of sizes. Click on the links below to learn more about the individual varieties or scroll down further for an overview of the 'family' of Laurel hedge plants. Laurel hedge plants are one our most popular groups of evergreen hedging and its not hard to see why - easy to grow, quick covering and they look great all year! Laurel hedge plants are available from Hopes Grove Nurseries in all of the most popular species, they make ideal hedging plants for a wide range of purposes. Because all the varieties we supply are evergreen they are excellent for bringing all year-round privacy to your garden, they look great 12 months a year and the different varieties are suitable for Laurel hedges of all sizes. All the species of Laurel hedge plants that we grow are tried and tested, reliable hedging varieties that are easy to grow and maintain and suffer from few pests and diseases. We grow most varieties in a very wide range of sizes from economical bare root plants through to beautiful big root ball plants, potted plants for all year-round planting and instant hedging options for immediate screening. You can be sure we have the ideal variety in your chosen size for your garden hedging or screening needs. All of our Laurel hedge plants have a dense bushy habit of growth, as well as providing structure and privacy to your garden all year, they will give excellent shelter and wind reduction, their evergreen leaves will also go a long way towards absorbing pollution and noise. Bay Laurel (Laurus nobilis) The Bay tree is an excellent evergreen for hedging or topiary and is the same plant that yields the aromatic bay leaves used in the kitchen. Bay is a Mediterranean plant that appreciates a warm sunny spot with shelter from harsh winds. Common Laurel (or Cherry Laurel) is the most popular and fastest growing variety, it has beautiful big glossy evergreen leaves and is a great choice for all types of evergreen hedging purposes where it can be maintained at any height from 1 metre to 4 metres (or more) in height. Common Laurel is available from us in a very wide range of sizes including bare root and root ball hedge plants as well as instant hedging. Caucasica Laurel is similar to Common Laurel and grows at least as fast but with a slightly more upright growth and narrower leaves. It is particularly tough and hardy, ideal for all types of evergreen hedging, especially if you are looking for a narrower Laurel hedge. Etna Laurel is a very bushy variety of Common Laurel that covers particularly well, especially in more difficult situations such as shade. The new growths of this variety are an attractive bronzy-orange colour that contrasts nicely with the glossy green of the older leaves. Portuguese Laurel is a particularly attractive variety that has smaller glossy deep green leaves and rich purple-red stems, it is the hardiest variety of Laurel hedging that we supply. This is an excellent species for large evergreen formal Laurel hedges – and unlike other Laurel hedges, it grows very well in chalky soil. 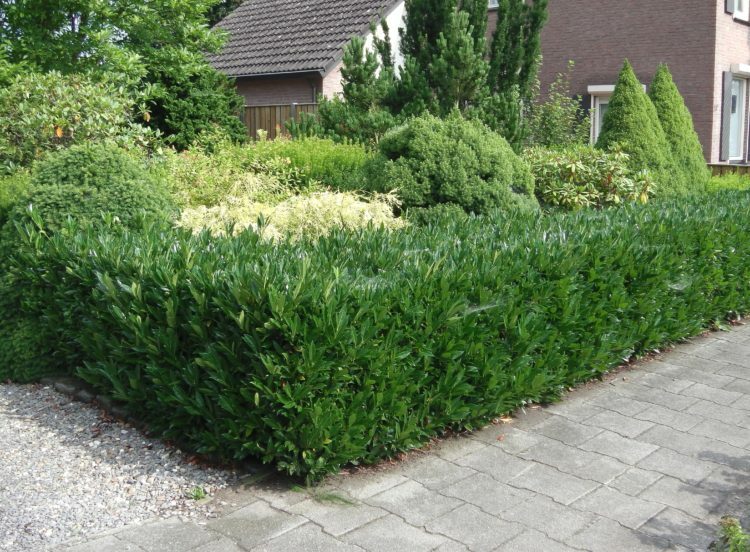 Compact Laurel (Prunus laurocerasus ‘Otto Luyken’) is an excellent smaller variety of Cherry Laurel that is ideal for Laurel hedges up to 1 metre in height. This versatile plant makes a good Box hedge replacement and is often used as evergreen ground cover. Untrimmed plants will produce a vibrant display of white flower clusters in spring that develop into red-black fruits that sre very popular with birds. The Spotted Laurel (Aucuba japonica ‘Variegata’) is in fact from a different plant family but has similar large evergreen leaves that are splashed with yellow and makes an excellent low maintenance hedge of back of border shrub that will look great and keep its colour all year. Spotted Laurels are very tolerant hedging plants growing in all situations from full sun to full shade. You can find more details about our individual varieties of Laurel Hedge plants by clicking on the links above, or scroll further down this page for some helpful information about the Laurel family including how to grow them, where to grow them, Laurel hedging problems, Toxicity information and our guide to Laurel Hedging alternatives. If you have any other questions please do call our hedging experts on 01580 765600 or alternatively get in touch via our contact page. What type of soil is suitable for Laurel hedge plants? If you have chalky soil then its best to avoid the Cherry Laurel varieties – instead choose from the Bay Laurel, Portuguese Laurel or Spotted Laurel as these three varieties all do well on chalk, or you could choose from our complete list of plants suitable for chalky soil. If your soil is poorly drained and becomes waterlogged during wet weather – then Laurels aren’t the best plant for you, they are unlikely to grow successfully in these conditions. We would recommend you take a look at our list of plants for wet sites instead. What kind of site is suitable for Laurel hedge plants? Apart from the Bay Laurel (which needs to have full sun), all other Laurel hedging varieties on this page are very versatile plants, good for both sunny or shady areas. (If you are planting a Laurel hedge in the shade of other, larger trees and shrubs remember that the new plants will almost certainly need extra attention to watering for the first year or two until their root systems have established sufficiently to compete with the larger plants around them). Laurels are not suitable for very exposed and windy sites (we would recommend you choose from our list of plants for windy and exposed sites instead) although Laurel ‘Etna’ and Portuguese Laurels are the hardiest of the bunch if you really are set on a Laurel hedge in which case we would recommend protecting the new Laurel hedge for the first season with some well anchored windbreak netting. For gardens by the coast choose either the Bay Laurel or Spotted Laurel hedge plants as the foliage of other varieties is likely to get scorched by the salty conditions. What are the alternatives to Laurel Hedge plants? Laurels are an enduringly popular hedging plant and one of our best-selling species at Hopes Grove Nurseries, they are however just one of many evergreen hedging species that we grow and sell. You can view the complete range on our evergreen hedging page. Daisy bush (Olearia macrodonta) – lovely silvery grey evergreen foliage with heads of fragrant white flowers. Elaeagnus ebbingei – another evergreen with silvery foliage and scented flowers. Griselinia littoralis – a popular hedging species with attractive apple-green oval shaped leaves that is easy to maintain. Osmanthus burkwoodii – this evergreen hedging species has much smaller leaves and exceptionally fragrant white flowers in Spring. Privet (Ligustrum) – we stock the Green, Golden and Wild varieties of Privet, all make excellent hedges. The Golden variety is particularly colourful. Photinia Red Robin – an evergreen hedge with leaves that are similar in size to Laurels, grown for its spectacular red new growth that appear in spring, and sometime intermittently later in the season. Pyracantha – prickly evergreen hedging shrubs with masses of white flowers in late spring followed by a colourful show of berries in Autumn. Viburnum tinus (Lauristinus) – smaller leaves than Laurels, this is a hardy hedging species well suited to exposed gardens, the white flowers appear in Winter and have a long season of interest. How fast do Laurel hedge plants grow? The maximum rates of growth above will be achieved if the new hedge is kept free of weeds and watered well in dry spells, ideally with a mulch applied. Most new hedges won’t make the maximum amount of growth in their first year while the roots get established. Laurel hedges that are competing with weeds or grass or are planted under the canopy of larger trees and shrubs will almost certainly grow more slowly. Are Laurel hedge plants poisonous? With the exception of Bay Laurel the short answer is yes, all of the Laurel hedging varieties on this page are poisonous to both humans and animals. 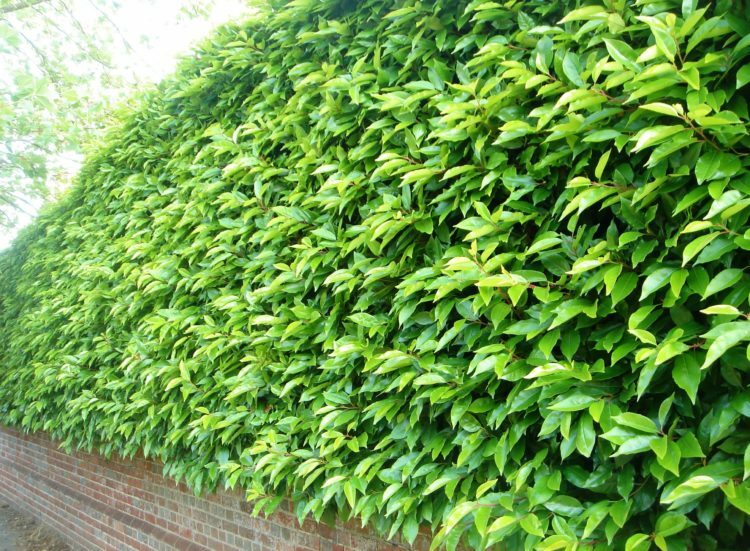 Laurel hedges planted in gardens are often in the proximity of both pets and young children and we are not aware of any problems arising, the hedge holding no particular attraction to either child or pet. If you are concerned about the toxicity of Laurels then we would recommend choosing the non-poisonous Bay Laurel, or another alternative hedge. If your new hedge is accessible to livestock we would recommend you choose an alternative species, if this subject is of special importance you may wish to consult a vet before making a choice. What is the best way to plant Laurel hedge plants? Planting a new hedge is a rewarding job and Laurels are no exception! The same basic principles apply to the planting of any new hedge, preparing the site well and removing any perennial weeds that may be present and improving the soil if it needs it. You can find a complete and easy to follow guide on our how to plant a hedge page. We always recommend Bonemeal as the best fertiliser for new hedges ensuring it is well mixed with the soil, and Rootgrow mycorrhizal fungi applied at the time of planting to give your new hedge a head start. When is the best time to plant Laurel hedge plants? Bare root hedging plants – these are the cheapest option and are field grown, they are lifted and the soil shaken off before being carefully packed and delivered to you fresh, ready for planting. They are available for planting from November until April when the plants are dormant, this is the correct time for planting. Root ball hedging plants – these are beautiful big bushy plants grown at with lots of space in our fields for several years giving instant effect at comparatively low cost. They have a slightly longer dormant season so are available from October until early May. Potted hedging plants – are delivered to you in the pots that they have been grown in, because there is no root disturbance and therefore no trauma to the plant these hedging Laurels can be planted at any time of the year, we don’t need to wait for them to go dormant. Instant hedging plants – like potted hedging these pre grown hedges can be planted at any time to give instant hedges when and where you need them! How many Laurel hedge plants will i need? There is never a single precise answer to the number of plants required for a new hedge as this depends somewhat on the size of plant and how patient you are prepared to be, but the general principle is that if you set the hedging plants closer together the hedge will fill out and develop more quickly (and be bushier at the base due to the gaps between the plants being smaller) and conversely, if you plant them further apart you will need to be a little more patient but wider spacing can still give excellent results over time. For larger potted Laurel hedging plants of all sizes and our bushy Root ball hedging up to 150cm tall, two plants per metre in a single row is plenty (50cm apart), reducing this to 1.5 per metre (66cm apart) will still give very good results. The largest root ball hedging Laurels above 150cm in height may be planted at 1-1.5 plants per metre (66-100cm apart) and will give good coverage, planting 2 per metre is possible but it can be a squeeze fitting them in! When is the best time to trim a Laurel hedge? Laurel hedges may be trimmed at any time during the season but its best to avoid the coldest months of the year as the cut edges may be susceptible to frost damage. Many text books advise trimming Laurel hedging plants with secateurs to avoid cut edges to the large leaves, it really isn’t necessary. 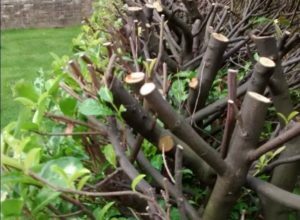 You can use shears or a hedge trimmer, the cut edges will heal and cover with new growth quickly, especially if trimming is carried out in the Spring. Laurel hedges of all sizes can have a habit of becoming wider with each passing year taking up more and more valuable garden space, be sure to cut your hedge back tight each time, right back to where the growth started in the Spring, don’t be frightened of being hard on it! How do I rejuvenate overgrown Laurel hedges? Laurels are one of the most responsive species to the major surgery of hedge restoration. Even the most hopelessly overgrown hedges can be drastically reduced in size and the unpromising woody stems will sprout with new foliage. The best time to cut the plants back is in early Spring, well before the hedge is coming into growth (but provided the weather is not cold and frosty, if it is then wait until conditions improve). Start by reducing the height using a taught string line to keep it level, the height can be reduced drastically by several metres if necessary (even taking the plants back to stumps) although the work can be split over a couple of seasons if you are cutting the height back by more than one third. The sides may be cut back at the same time or you might choose to reduce one side at a time, it really depends on how sensitive you are to the temporary lack of privacy that will inevitably follow for 2 or 3 seasons if all the work is done at once. The sides may be cut back by as much as several metres if necessary taking care to remove any diseased and dead wood as you go and making sure all the large cuts are clean without any ragged edges that will encourage disease to enter. Once the hedge has been cut back it’s a good idea to give it a good feed with a general fertiliser such as growmore, if possible forking it into the top 5cm of the soil around the hedge followed up with a good thick mulch of wood chips or garden compost after watering the fertiliser in well. New shoots should start to appear from the bare wood within a couple of months, any long whippy growths should be pinched at the tips to encourage bushiness. Depending on how comfortable you are with the amount of privacy the new growth offers, you may choose to cut the other half of the hedge back the following Spring or leave it another year. Either way it should be possible to fully rejuvenate an old hedge within 3 or 4 years. What is the best fertiliser for established Laurel hedge plants? Customers often ask us what is the best fertiliser for Laurel hedging plants. The most suitable feed depends on which stage the hedge is at. When you are planting a new Laurel hedge we always recommend using bone meal, this is a natural organic fertiliser that should be well mixed with the soil. One kilo of bone meal will be sufficient for a 15 metres of hedge planting. (We also recommend using Rootgrow mycorrhizal fungi at the time of planting to give the hedge a head start. These naturally occurring native fungi form a symbiotic relationship with your new hedging plants almost immediately allowing them to develop the large secondary root system necessary for successful growth and establishment without delay). Once your Laurel hedge is established we would recommend an annual feed early in the spring with a balanced fertiliser such as ‘Growmore’, this is very beneficial to a Laurel hedge if applied at the same time as a mulch (a layer moisture retaining material like bark chippings, lawn mowings or garden compost). Older Laurel hedges can sometimes run out of steam a little, perhaps making very little annual growth and looking rather pale. Assuming there is no obvious underlying cause for this (like a new concrete driveway or extension encroaching on the root run) then we recommend a specialist fertiliser to encourage root and top growth together with magnesium to improve leaf colour. Both Seaweed Bio-stimulant and After-plant Evergreen feeds are perfect. If the root run is very dry, then it’s a good idea to gently incorporating the fertiliser into the top few centimetres of the surrounding soil with a garden fork and then watering very well after application. Mulching at the same time can also help to retain moisture. This should freshen up your tired looking Laurel hedge within a few weeks, especially if undertaken in late spring just before the new season growth begins. Laurel hedging plants tend not to be susceptible to pests and diseases, particularly once established. Occasionally pests and diseases do occur but they are rarely serious and do not warrant intervention with chemicals or sprays, the hedge will normally recover naturally. Newly planted Laurel hedge plants (bare roots in particular but sometimes root ball plants as well) can drop some or all of their leaves after planting. (Often, they will turn yellow first before dropping) This is most common if the weather is very harsh during winter or turns very warm quickly in the spring especially when the hedge is planted late in the season. Leaf loss is a stress response to conserve water. If the new plants are kept well-watered and have been planted in suitably prepared soil they should re leaf later on – during late Spring or early Summer once the roots have become established. Leaf drop can be minimised by good soil preparation, sufficient watering after planting, mulching and using Rootgrow when planting as this will help the new root system to establish much more quickly. Bay Laurel and Spotted Laurel hedge plants are always pot grown and do not normally suffer from leaf drop. Laurel hedge plants can suffer from frost damage in Autumn, winter or Spring. Damage in the Autumn is often caused by sharp early frosts and is limited to soft late season growth which turns black and shrivelled. It is a good idea to cut off any affected shoots back to clear healthy wood as this will prevent fungal diseases from taking hold through the frost damaged tissue. Young Cherry Laurel plants are most commonly affected. Frost damage during the winter months can cause brown patches on established Laurels of all types and is usually at its worst when there is a very cold wind with no protective cover of snow to protect the winter foliage. Affected hedging plants can look rather unsightly until a new flush of growth appears in late Spring by which time the brown leaves will usually have moulted. Frost damage in the Spring almost always affects the soft vulnerable new growth as it emerges. The affected shoots will wither and turn black very quickly, while this can look unsightly there should be no lasting harm as the days are getting longer and the weather getting warmer meaning the plants should make a new flush of growth fairly quickly. This is a fungal disease that appears as a white powdery coating on the leaf surface of the younger growth at first. As the fungus develops the underlying leaf tissue will turn brown and die and the young leaves can often be left with holes, brown patches and ‘tatty’ edges to them. The symptoms of mildew can make Laurel hedge plants look more like they have been attacked by insects rather than a fungus. Powdery mildew can often develop due to weather conditions, while it can make the plants look scrappy and unsightly it is not serious and when environmental conditions change the plants will grow out of it. The Laurel hedge plants can be trimmed, removing the affected leaves, or you could treat the plants with a mildew fungicide, in all honesty neither is necessary as the plants will recover on their own. Shot hole is a disease that can occur on Cherry Laurel hedge plants, different types of the disease can be caused by bacteria or fungi. It can be identified by the brown spots that appear on the leaf surface, as the plant brings the disease under control the diseased and healthy parts of the leaf separate and the diseased part drops out leaving round holes in the leaves. Both types of shot hole are spread by warm and wet conditions during the growing season and most commonly affect younger plants. When environmental conditions improve, and as the Laurel plants get older they will almost always recover without the need for any kind of chemical treatment. If your hedge does show signs of shot hole it is worth regularly sterilising tools when trimming the hedge to limit any potential spread, also do avoid composting any affected hedge cuttings to stop a potential cycle of infection in the garden.